CRPF Constable Tradesman) Examination 2018: Central Reserved Police Force has been invited online applications from the male and female candidates of Indian citizens to recruit the available 2945 vacancies of Constable (Tradesman/Technical) posts in CRPF through direct recruitment. Closing date of applying online for this CRPF Constable (Tradesman/Technical) Examination is 01-March-2018. The selection for CRPF Constable (Tradesman/Technical) Recruitment 2018 is will be comprises of written and physical tests. The eligible candidates have to submit only online applications of Constable through CRPF official web site only at http://www.crpfindia.com/. For more details regarding this CRPF Constable (Tradesman/Technical) recruitment please see below given details. 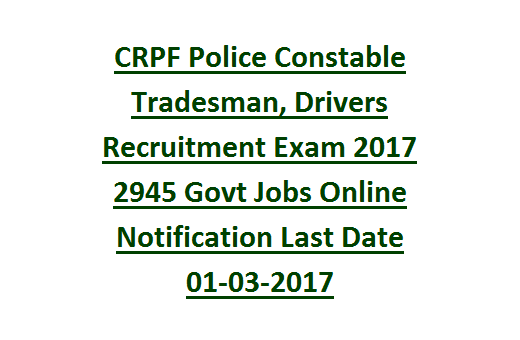 Click here to see the official notification of CRPF Constable (Tradesman/Technical) Examination. There are total 2945 vacancies available in CRPF Tradesman and Technical Constable current recruitment. State wise details are given below. The candidates must have qualified 10+2 from a recognized board or institute. For Constable Tradesman Posts matriculation/10th qualification is required. For Constable MMV Mechanic Motor Vehicle posts 10th pass with ITI in MMV. For Constable Driver 10th pass and Heavy Transport Vehicle licence required. For CT/DVR posts age limits as on 01-01-2017 is 21-27 years. For all other Constable posts age limits are 18-23 years. Age limit for SC/ST candidates 5 years and for OBC candidate's 3 years of age relaxation is given. Selection for this CRPF recruitment will held in two stages. Written test will be conducted for 100 marks consist of 2 parts with 120 minutes duration. Part 1 consists of 4 sections each section having 50 questions and each one carries one mark. Part 1 is all questions are multiple choice objective type. Section D: Ability to observe and distinguish patterns. Trade Related Questions will be given. Each question carries one mark. For the candidate of Hill places and eastern states Height is 162.5 cm for male and 152.5 cm for female. Weight: Weight will be considered depend upon the height and age. For female candidates 12 minutes. For female candidates 1.6 Kilometer running in 8.30 minutes. For female candidates 800 meters running to be completed within 4 minutes. Pay band is Rs. 21700-50000/- Level 3. Eligible candidates of General/OBC have to pay Rs.100/- towards application fee through online using debit/credit card or net banking or using SBI chalana or using e payment of post offices. The eligible candidates must have to apply through online only. Before applying online please read the official notification and instructions to apply details carefully. To fill the application form online the candidates have to login to the www.crpfindia.com website and click on online application for Constable (Tradesman and Driver) and complete the registration process while filling the required fields. Must have uploaded the scanned photo and image and must provide a mobile number and valid mail id for further communication. Click here to apply online for the Central Reserved Police Force Constable Tradesman Recruitment 2017. Please share this read Constable (Technical/Driver Jobs) Recruitment 2017 article to your lovable friends through social media sites.